Hello Aspirants, looking for tips on how to study or Clear CDS exams. In this article we have in brief explained everything how you should prepare for different types of questions and topics in the written examinations. Go through the complete article and feel free to ask questions or queries in below comments. “Fire in the belly leads to success “- as they say, will help you to Clear CDS exam, my friends. 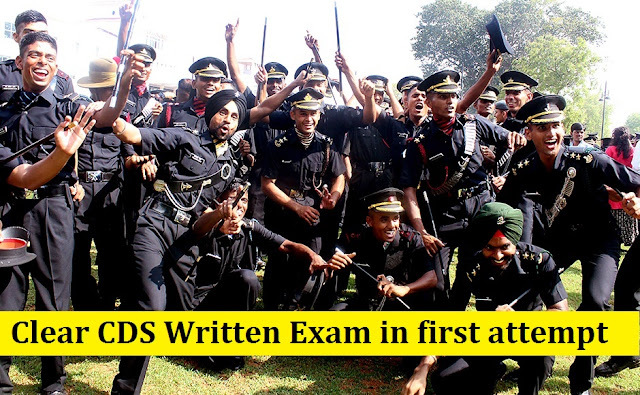 The UPSC conducts CDS Exam twice a year. One in February and the other one in September/October. The cut off will decide your entry to AFA, IMA, NA, OTA. For candidates who are giving preference to OTA, they need not give Math’s paper. This exam includes 3 papers, i.e. English, General Knowledge & Math’s. One needs a rigorous preparation to clear CDS exam. You'll know how to do it as we proceed with this article of how to Pass CDS exam.Feel free to ask questions below in comments. Aspirants appearing for CDS written exam should know all the subjects and the lessons which will be asked for your CDS exams. CDS exams generally focuses on mainly 3 subjects English, General Knowledge and Mathematics. Candidates should be well known with all the lessons which will be questioned in the exams.Just work on your weak subjects which you think difficult for you. Starting to work right from now is the most important thing which will help you to clear CDS exams in one shot. You have to be disciplined and show dedication towards your studies in order to pass CDS exams. Note*: For OTA you don't have Maths paper. You only have to focus on two paper ie English and GK paper to Clear CDS exam. IMA - 125 - 140 marks. Aspirants should know that CDS cutoff marks is generally around this marks but clearing only cutoff marks won't help you in merit list. Candidates should try to score maximum marks in written exams which will help them in getting through merit list. For English and General Knowledge paper both consists of 120 questions and paper is of 100 marks that means you get 0.8 for right answer and for wrong answer 0.2 marks is deducted. And for the Mathematics paper there are 100 questions for 100 marks you get 1 mark each for your right answer and 0.2 marks is deducted for wrong answer. First of all we'll talk about English. Generally the paper is easy if you are well versed with English. But if you are not, don’t worry, you can still clear it. There is a pattern that is followed in this exam. There are certain things which come for sure. These are Antonyms and Synonyms, Comprehensive Passages, Spotting the errors, Jumbled Sentences and Ordering of sentences. Now if you follow a planned approach towards the exam you can easily clear CDS. 1. Synonyms and Antonyms- People think there are n number of words in the vocabulary, how on earth is it possible to know them all. However, the smart way to catch hold of this portion is to Pick up the previous year’s CDS English question papers and take a note of all the words that have been asked. Now write them on blank sheets one by one. Trust me when you do this, half of the work is done. Because mere reading them from the book won’t help you remember them. so when you do this, the words remain in your mind for a longer duration. Second step is memorizing. Have you ever tried early morning studying? Yes. I'm talking about getting up early in the morning and just reading those words which you have written. Give them a glance. Then try remembering them. Third step is to use these words in your routine. For e.g.- I try to use these synonyms or antonyms in my conversation as far as possible. Be it Facebook chat or whatsapp or your face to face conversation with your friends. Because when you do so, they stick in your mind. Is is is safe to give out bank account number.The reason behind this is, when we use these words in our daily communication, our brain tends to form an image related to the conversation in which you have used the words in particular. Like you are sitting on a bench in park with your friend and while talking you have used a word, then next time you hear that word, you'll immediately remember the word and hence will be able to answer it correctly. So this is how you crack this exercise. 2. Spotting the errors- We all know that finding faults in others is in the nature of humans. Haha... So why not put it to better use and clear CDS exam? This exercise consists of sentences divided into four parts and one of them has an error or no error in the whole sentence at all. This exercise is completely based on grammar. So the basics should be clear. There is a book called CDS Path finder, it has an organized explanation of how to solve this exercise. There are various rules regarding grammar. Usually we talk slang English and tend to go by them in the exams too. This is the line where most of the people go wrong, even though there spoken English is good. The rules based on Noun, pronoun, tense, phrases, adjectives etc all are given in that book. Plus it has sample exercises too. Now what you have to do is, first, carefully read the rules written in the book and try to memorize them. And then start solving them one by one. Initially you will be able to solve only a few but over a period of time you will solve most of them. This is based on practice, so please practice. 3. Jumbled sentences- These are quite tricky. One needs to read the sentence first. The trick here is do not try to solve the question all by yourself, don’t try to find the sequence all by yourself. UPSC has given you options, just apply the options and one of them will be correct. Most of the candidates try to bring out the sequence and then the look for the matching option. This consumes time and hence they find it difficult to score in here. 4. Ordering of sentences- This is a bit tough as compared to all other exercises. The best way to solve this is to take the question as a narration of a story. That way your brain starts thinking more accurately. Same trick, apply all the options and find out the correct one. Apart from these regular exercises, there are some questions like sentence improvement, fill in the blanks with appropriate words, etc. You see, when you thoroughly read and practice spotting the error exercise, all these miscellaneous questions are taken care of, so no need to worry much. Just focus on the main four exercises because these are the ones where you can score maximum. Okay. Now in addition to these, you should listen to English songs. They will enhance the receptivity of your brain as far as English is concerned. During the exam- the moment you get the question paper, go through it, just give it a glance, and have a good feeling about it. My personal experience says that if you have a positive feeling that you can successfully solve the paper then your chance to clear CDS has a high percentage. Moving on to the paper of General Knowledge, this is the paper where candidates call it as unpredictable question paper. But the beauty about this paper is , candidates belonging to all the streams have an equal opportunity to solve this paper. Like students of science, commerce and arts can solve them easily if they have the right approach. In this paper, a pattern has been followed over these years. The portion of science holds 30% marks, Current affairs- 20%, geography- 20%, polity- 20%, history- 10%. This is the usual pattern. The candidates are worried about current affairs the most. 1.Current affairs- put to use all the resources. Magazines like Competitive success review, Competition 360, etc. (links) Make notes wherever necessary. Read from internet and newspapers. And always be systematic in your work. Do not make notes in a haphazard manner. There should be heading and some detail about it. And if possible, try to read and write so that you have some idea about the news with the first writing itself. 2.History- Thoroughly read the book pathfinder. The reading should be normal. Don’t stress yourself with the first reading itself, like what are the dates, who what when….. The best way to know about history is…. “His-story”. Read it as if it were a story. Actually it is a story if you see it from one angle. After you are done reading the whole syllabus thrice, now go ahead and start off with making datelines. As you know there are three parts in history, i.e. Ancient, Medieval and Modern. Make notes, like give headings, subheadings and some details. When you are done with the first 2 parts, and come to modern history, you will have to have a different approach. Here start with making notes about all the governor generals and viceroys. Their tenure, what all happened during their reign, who all were the eminent personalities then, etc. And then come the revolutionary movements. One by one just make notes about all these movements led by our freedom fighters. This way, you can cover up the portion of history. 3. Geography- This is the most interesting subject of all. Just reading this subject apprises you of what all is there. Again give it a reading, once, twice, thrice. No need to make notes as this subject is easier than others and just reading will help you remember it. However, there are certain things on which needs focus, For eg- Physical features of India- Mountains, Rivers, their deltas and estuaries etc. 4. Indian Polity- This is the toughest of all. Here, mere reading won’t help. The level of English used here is technical. The words of Civics or polity need to be comprehended first. Also the questions asked from this portion are application based. So one needs to be thorough here. Never go by here and there information regarding polity. This is a very sensitive subject and one small silly mistake can cost you an answer. Our constitution is divided into three parts. 1. Legislature 2. Executive 3. Judiciary. Read from the book about all three and have some basic knowledge about what it is actually about. Most of the people get confused regarding the working of the union govt and a state govt. Start making your notes. 5.Economics- This subject needs just a reading. The book has enough knowledge. Make sure you read about our 5 year plans, economic terms, Census- most important. 6.Science - Physics, Chemistry and Biology. Regular science stream students have the advantage here, but other students too can score well here. The concepts involved in this subject are basic so read from the book and get your basics clear. Then start solving previous years question papers. There is not much to mug up her, its science… so start off with solving sample questions. This will help you beforehand to score well and clear CDS exam. The question papers in the last few years have been tough! Not that the difficulty level is raised but the questions are lengthy, hence consume time. Most of the candidates consider this subject as a scoring one, and indeed it is, but where they fail is, they don’t practice enough. This is not a subject where you can go with the attitude of last minute reading or glance. Here you need to put in long hours and solve maximum no of questions in stipulated time. Trigonometry and Mensuration carry more weight age. Focus on these two topics more, followed by statistics. Also solve previous years question papers, that too in time limit. This will make you land scoring good marks in math’s and hence you will clear CDS exam. So everyone out there who really wants to clear CDS, work hard my friends, because there is no short cut to success. If you work hard, you’ll end up seeing yourself in that uniform, for sure! Friends now if you work with full dedication and disciplined way you will surely succeed in your aim. Start right now this is the right time to chase your dreams which you have seen. You have to plan well make your schedule and start working on your subjects. If you think you weak in any of subjects start giving more time to that subject because this will help you to clear your CDS written examinations. One more important thing, all those who feel that they find it difficult to make notes of the subjects, feel free to mail me or you can follow us on Google+ or Like our official Facebook page for details regarding clearing CDS written examination. For more details regarding CDS written results, admit cards, Cut off let us know by commenting below. So set your aim and get started with- I have to Clear CDS exam! Hope you would have liked our article on how to clear CDS exams.For more details regarding CDS exams can comment below also Like our Official Facebook Page or can also subscribe us from your email id for details regarding SSB and how to clear CDS exams. when ever you have mentioned "book" in above article, did you mean CDS pathfinder only or some other books also? Is it sufficient to do all the topics mentioned by you and previous years question papers.